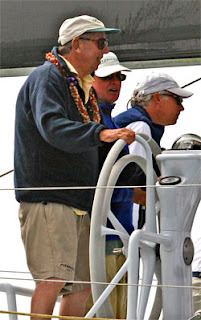 LOS ANGELES—Roy E. Disney, who died Wednesday at 79, was an avid ocean sailor who won the California-to-Hawaii Transpacific Yacht Race in record time a decade ago and backed programs to bring youth to the sport. "He was very competitive, but we always had a lot of fun on the boat," said Gregg Hedrick, who managed Disney's boats and sailed 100,000 miles with him over 24 years. "We always had the best sailors on the boat and that was what made it fun 'cause he was such a good sailor and he could hold his own with any of them." The nephew of Walt Disney competed 15 times in the Transpac, a 2,225-mile race that begins off Los Angeles and ends off Oahu's Diamond Head. Hedrick said Disney was a sportsman "but you knew when it was a competitive moment on the boat ... and we all worked really hard, you'd all work a lot harder for Roy because you wanted to see him win." In 1999, his 74-foot Pyewacket III was first to finish, completing the voyage in seven days, 11 hours, 41 minutes and 27 seconds. That broke the record of 7:15:24:40 set in 1997 by his son, Roy Pat Disney, who took over the job of skippering Pyewacket II after his father broke a leg and was unable to sail.